Marketing Business Intelligence Software Like…a 1980s Real Estate Seminar? It’s not an earth-shattering statement, and it also isn’t a flattering commentary on our society, but ads featuring attractive, provocative women have a proven track record selling everything from cars to beer to men’s fragrances to hokey ‘get rich quick’ real estate plans, advertised on hilarious late night TV ads in the 80’s. 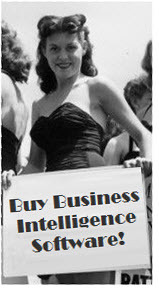 But can it sell Business Intelligence software? The ad in question has long since been removed from YouTube. I was thinking about the ad marketing team’s assumption that IT decision makers are all men, who want ads like this. The ad is a sobering reminder of how few women choose to pursue computer science degrees and careers in technology. Indeed, only about 9% of all CIOs are female. Carve the BI/DW market up based on verticals, namely higher education, with women occupying about 25% of CIO posts, and suddenly this ad is ticking off a quarter of that particular vertical.